J. London on Richmond Row, the second marijuana retail store to open in London, was designed to ensure customer experience is the top priority, says the team behind the store. From the moment customers enter the outlet’s age-gating area – where staff ensures everyone who enters is 19 or older – the experience begins. Customers are handed a “newspaper,” a four-page handout that includes information on how to use the store’s tablet system to browse products and make orders, basic facts on cannabis and its effects, and a detailed menu of the outlet’s many offerings. Once inside J. London’s 185-square-metre retail area, trendy music fills the air and a projector plays a custom-designed video on a large white wall. Shelves stocked with glass jars filled with cannabis – each outfitted with a special lid that allows customers to smell the product – line one side of the store. Another wall showcases bongs and pipes from Nish Glass, a high-end glassblowing company. “We’re creating a user experience that is unique and totally focused on the customer,” said David Craig, a consultant hired by store owner Ranjit Basra. Basra was one of 25 winners selected through a lottery system by the Alcohol and Gaming Commission of Ontario (AGCO), the province’s pot regulator, to open one of the first cannabis retail shops. “I figured somebody’s got to win,” Basra said of throwing his name in the lottery that drew nearly 17,000 expressions of interest. Basra, a Cambridge resident, said he decided to set up shop in London because of its strategic location along Highway 401 and the city’s accepting attitude towards cannabis retailers. London politicians voted 13-1 to allow the brick-and-mortar stores last year, while many communities across the province opted to ban to the businesses. London landed three of the province’s first 25 cannabis retail stores – the same number as Ottawa and just two fewer than Toronto. 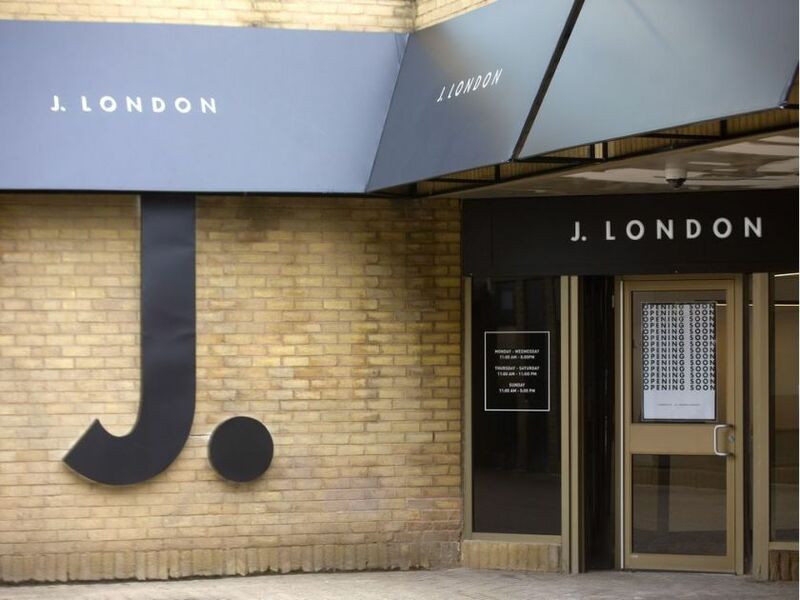 J. London’s anticipated Wednesday opening – a soft launch for family and friends was planned for Tuesday night – brings the number of stores operating in the city to two. Central Cannabis on Wonderland Road and Oxford Street opened last Monday, while Tweed on Wellington Road, near White Oaks Mall, is expected to open later this month. “It feels like we’re a part of history,” Basra said of being among the first to open. The AGCO said stores that weren’t open by the April 1 deadline would forfeit $12,500 from a letter of credit submitted to the regulator as part of the application process. Only 10 stores were able to open on time. J. London is in talks with the province and hasn’t yet been penalized for missing the deadline, Craig said. Located at 691 Richmond St., the store is situated beside the now-shuttered London Relief Centre, an illegal dispensary that closed in December following repeated police raids. J. London has a staff of 25, including a handful of employees who previously worked at various Southwestern Ontario pot producers, Craig said. “Our team has decades of experience in the cannabis industry,” he said.